All was going well, and I got into a nice rhythym. I reached the 9km mark and was very pleased to know that I still had plenty of steam left for that last 1km when disaster struck! The treadmill went into cool down mode!!! I frantically started pressing buttons - increase the speed back to 9kmph, increase the cool down time from five minutes to the required six minutes 40 that it would take me to run the last kilometre, and the treadmill had a hernia and just stopped. It was almost like the machine was saying, "sorry lady, you've had enough time. Now get off!!" Needless to say, I was quite gutted. I was looking forward to being able to say "I ran ten kilometres today!!". Now I can't. Sucky. I have a feeling that I may just be making this cardigan again in the future - its a lovely simple knit, and the pattern wasn't nearly as difficult to follow as I thought it would be. Drops patterns seem to have a bit of a bad reputation for being hard to read. I've found it okay. Pretty, huh? I'm using white Shibui, and the last instalment of the Knitsch yarn club - Kelly. And I couldn't help myself, I signed up for the next Knitsch yarn club the other day. I checked with Deane first, and he didn't (technically) say no, so I'm not entirely to blame... Next yarn club will have to be a Vintage Purls though - Morag writes the best sock patterns!! 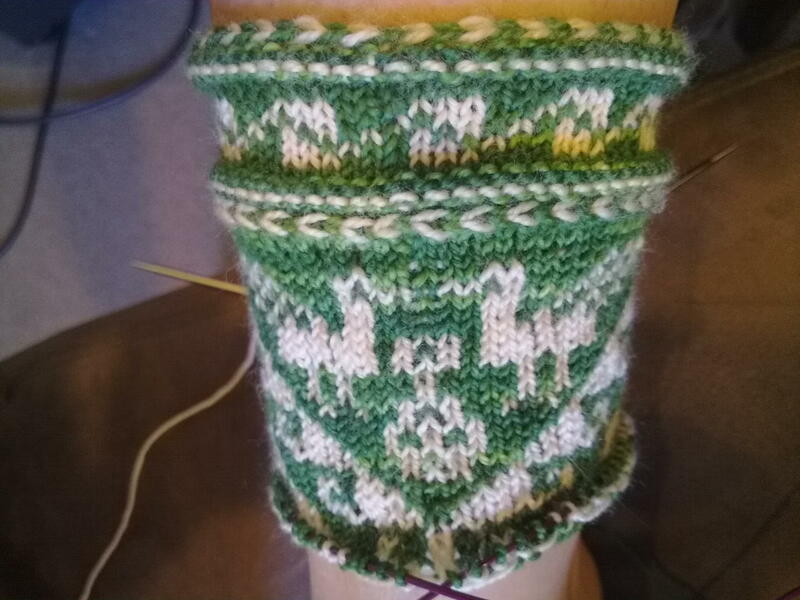 Of which, I still have one to knit - Leaflink. Its on my (ever-growing) to-do list. Must be off - things to do before picking the boys up from school - I'm running out of time! Hope you have a happy (and somewhat dry) weekend. Oh, Kreachr....that is some lovely sock! Keep it up, girl....you will be so proud when they are done. I sure do admire you for keeping fit....I have every intention of starting to exercise and then something comes up and those intentions go straight out the window....good job, Kreachr. 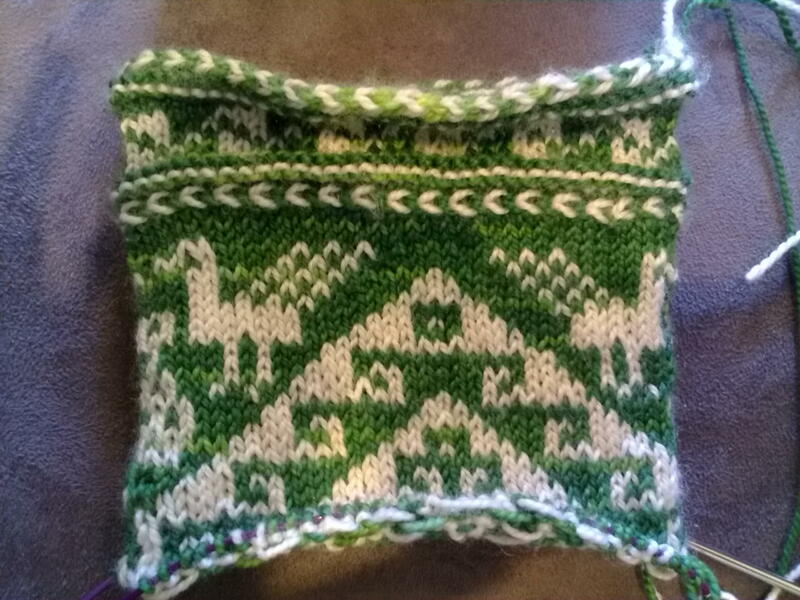 Brilliant update - you are one uber knitting machine. Put me to shame! One thing I had to wonder was if the gym had another treadmill... Good work on the running though! I've joined a gym this year and am really loving the addictive nature of exercise. And shortly, I've seen your mad knitting skills, you're pretty good yourself ;-) In fact, I was reading a blog the other day where somebody had just knit a scarf you designed. It was pretty cool! As for KAN, there's always next year! !